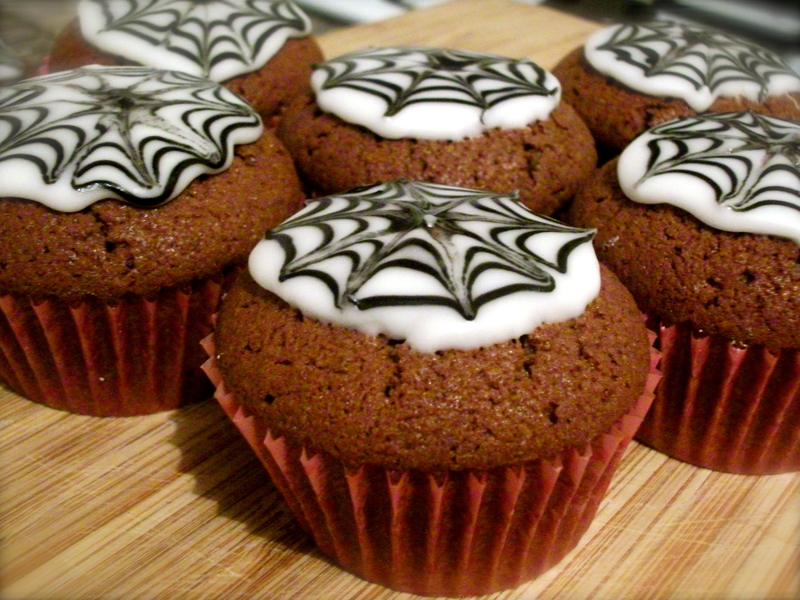 Cupcakes – Bake With Me! 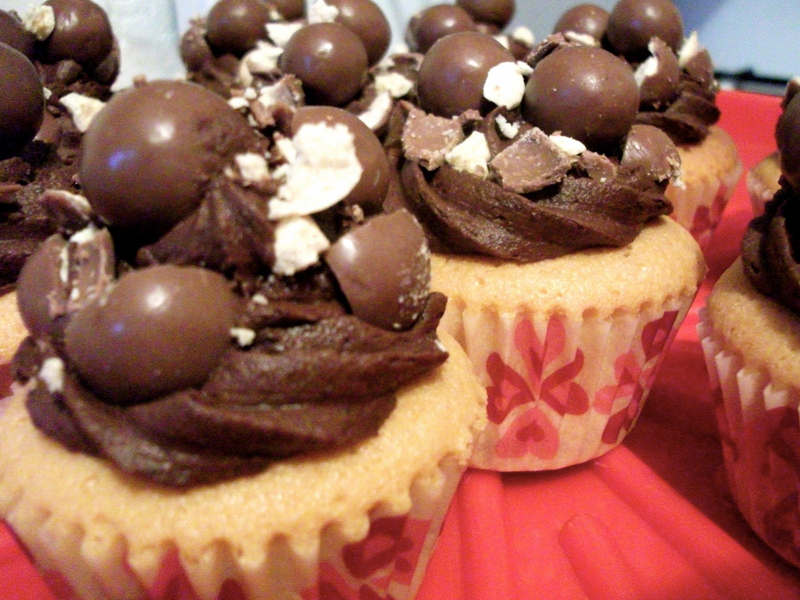 These Maltesers Cupcakes are such a fun idea and a perfect treat this weekend. Despite the original recipe having vanilla buttercream, I went with chocolate because in my eyes, the more chocolate, the better! 1. Preheat the oven to 180°c/gas mark 4, ensuring the shelving is centre. Line a cupcake/muffin tin with 12 cupcake cases. 2. Cream together the butter and both sugars until light and fluffy. 3. Add the vanilla essence. 4. Begin alternating between adding the flour and the eggs. Mix until smooth. 5. Add the baking powder and salt. Stir in the crushed Maltesers. 6. Equally divide the mixture between the cupcake cases and bake in the centre of the oven for 25 minutes or until golden brown and a skewer comes out clean. 7. For the buttercream, cream together the softened butter and icing sugar. 8. Add in the cocoa powder and gradually add the milk. 9. 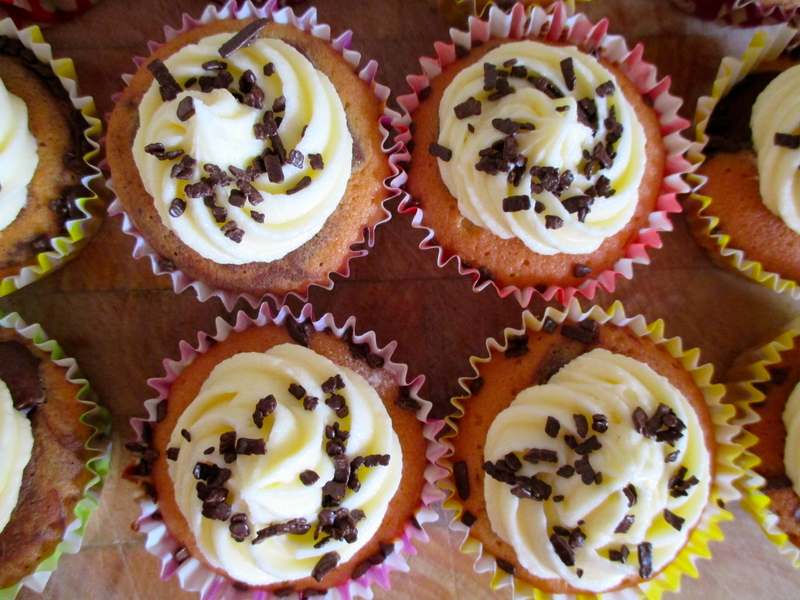 Either spoon or pipe the buttercream onto each cupcake and decorate each with Maltesers. I’d recommend you eating these pretty sharpish – just because the maltesers tend to go a little off over time. But they’re so delicious, I’m sure you won’t have any problems finding someone to eat them! 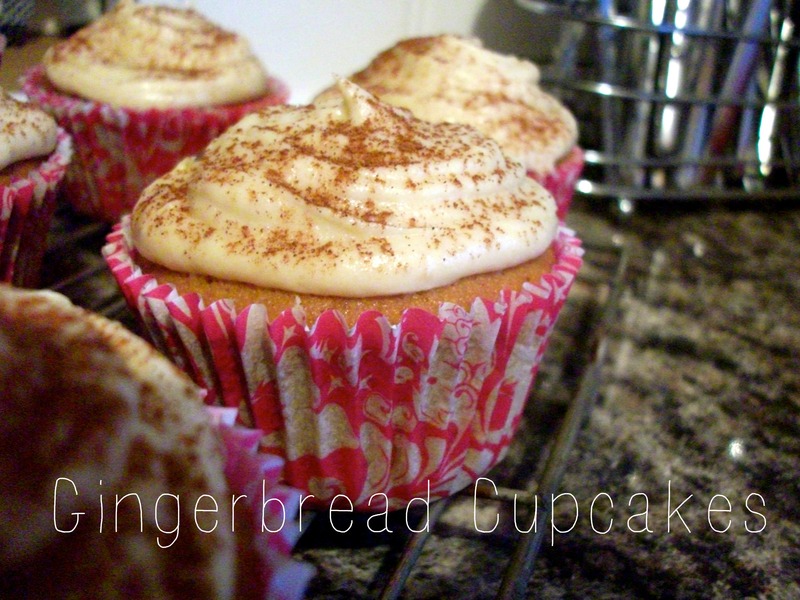 Despite it coming up to mid-January, if you’re anything like me and desperately missing the Christmas fun, hopefully these gingerbread cupcakes will re-kindle your festive spirit with their warm spices and sweet toffee buttercream. 1. Preheat the oven to gas mark 4. 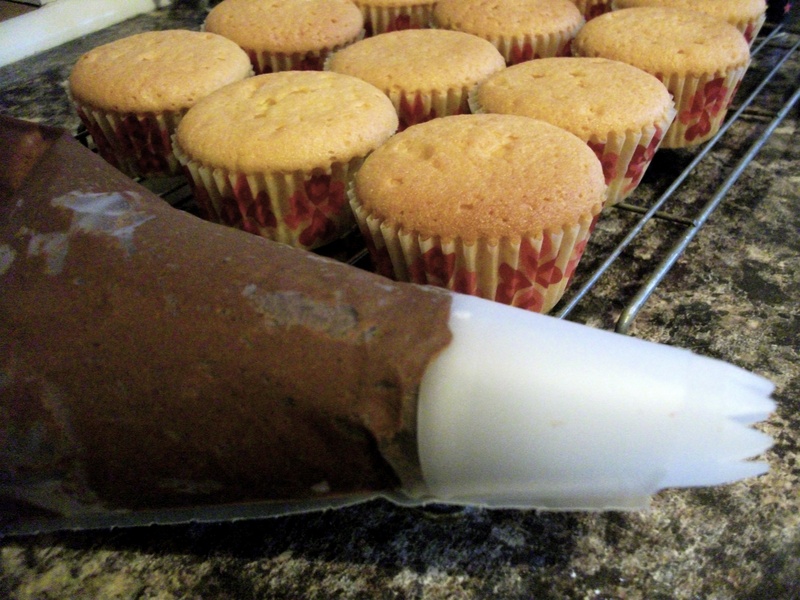 Place 12 cake cases in a cupcake tin. 2. Cream together the butter and soft brown sugar, until light and fluffy. 3. 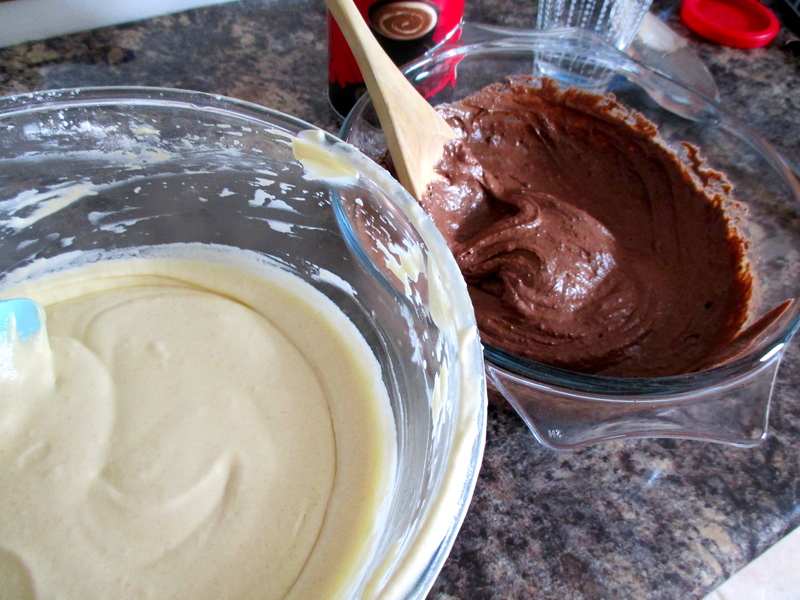 Gradually alternate between adding the eggs and sifted flour to the creamed butter and sugar mix. 4. Mix in the spices, the ground ginger, cinnamon and nutmeg. 5. Stir through the milk until well combined. 6. Divide the mixture equally between the 12 cupcake cases (roughly two teaspoons of mixture in each) and bake in the oven for 15 to 20 minutes, or until golden brown and a skewer comes out clean. 7. 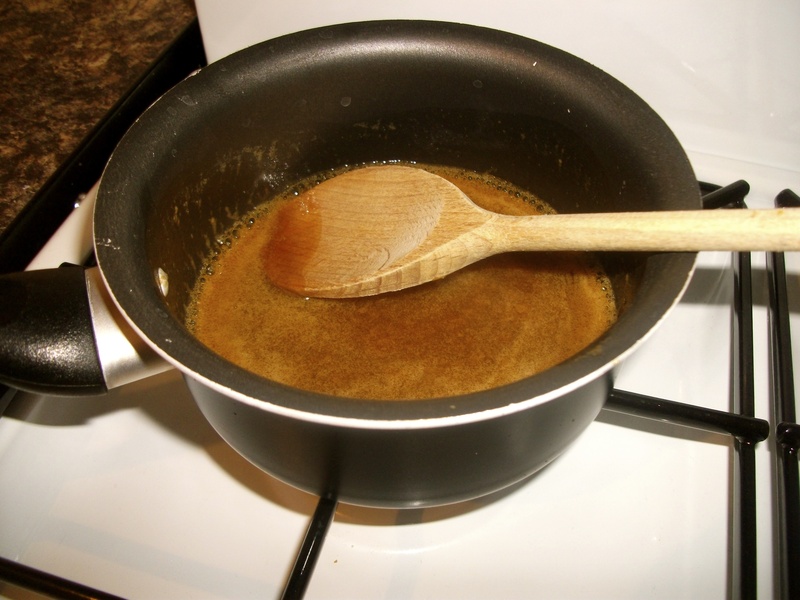 For the toffee sauce, heat the butter and soft brown sugar over a low heat. Add the milk to form a thick, glossy toffee sauce. Leave to cool to room temperature. 8. For the buttercream, cream together the softened butter and sifted icing sugar. Once the toffee sauce is cool, add to the buttercream and combine together. If the buttercream it too thick, add a splash of milk. 9. Either pipe or spoon the buttercream onto each cupcake. 10. Dust each with a little cinnamon before serving. Christmas day is less than 24 hours away now and festive cooking is well under way in my house. The vegetables are peeled and ready to go, the turkey is on the side defrosting. 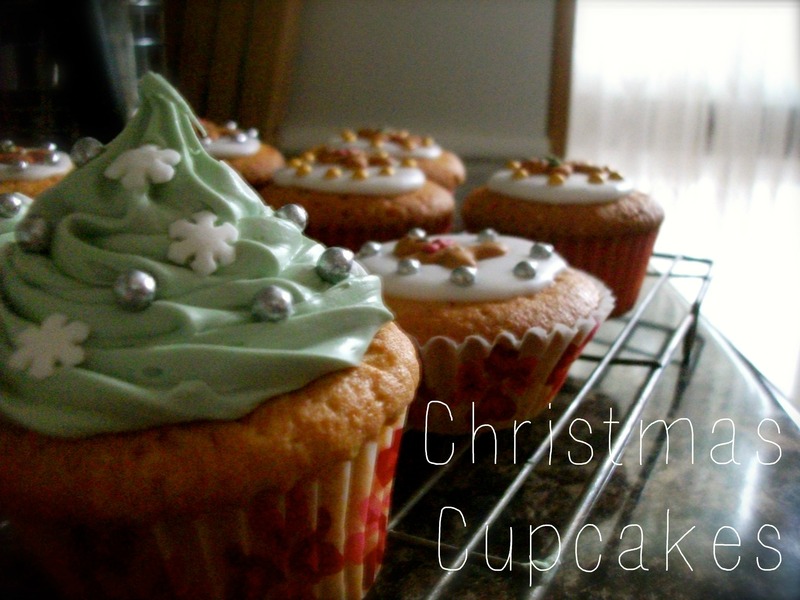 So with a little spare time on my hands, I thought I’d make some quick and easy Christmas cupcakes. 1. Preheat the oven to 170°C (325°F) Gas 3. Place 12 cake cases in a cupcake tray. 2. In a bowl sift the flour, sugar, baking powder and salt. Give the ingredients a mix before adding in the butter. Beat using an electric whisk until the mixture is of a sandy consistency. Add roughly half of the milk and mix until completely incorporated. 3. Whisk the egg, vanilla and remainder of the milk in a separate bowl before adding to the flour mixture. Beat until all the ingredient are mixed well and smooth. 4. Divide the mixture equally between the paper cases. Bake in the oven for 20 to 25 minutes, or until golden brown. 5. 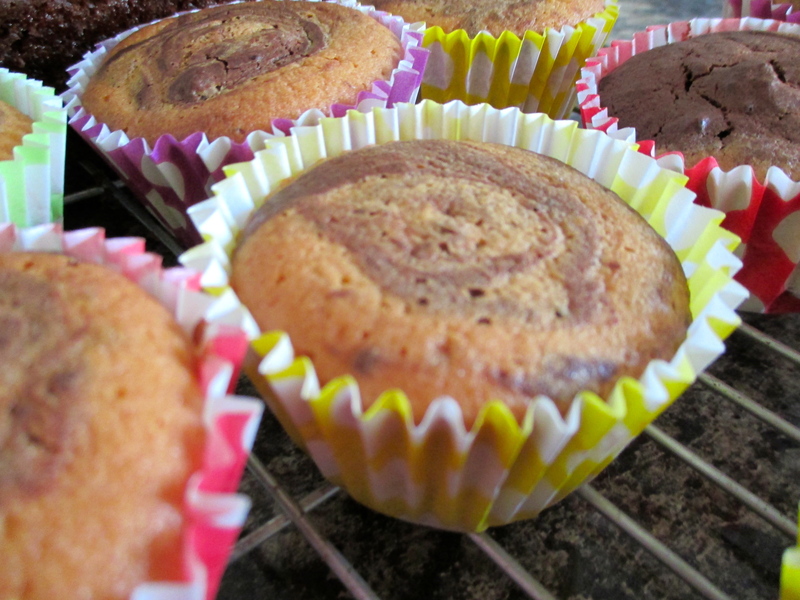 Whilst the cakes cool, if you’re making frosting beat the icing sugar and butter together. Gradually add the milk and vanilla extract and beat until light and fluffy. Pipe onto your cupcakes and decorate as you wish. 6. 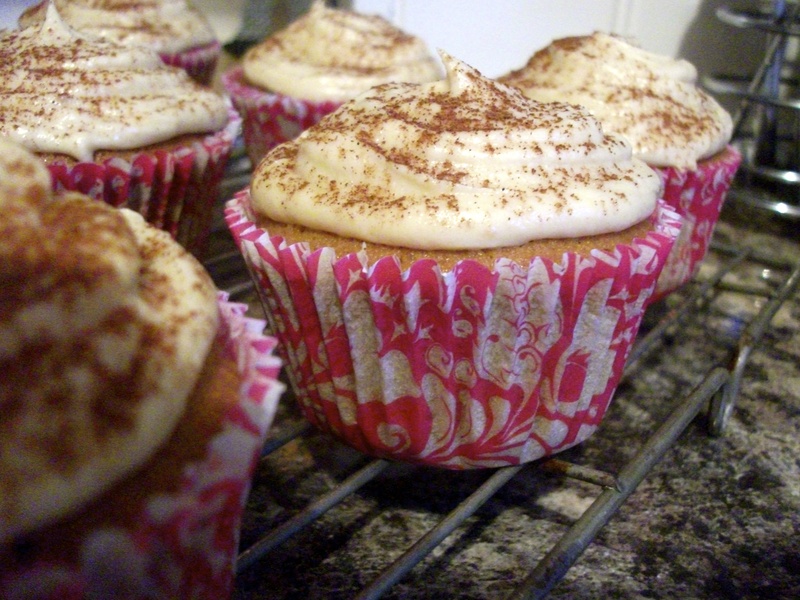 If you’re making plain icing, simply add a little water to your icing sugar and spoon onto your cupcakes. This is my attempt of a Christmas tree, complete with snowflakes and baubles! 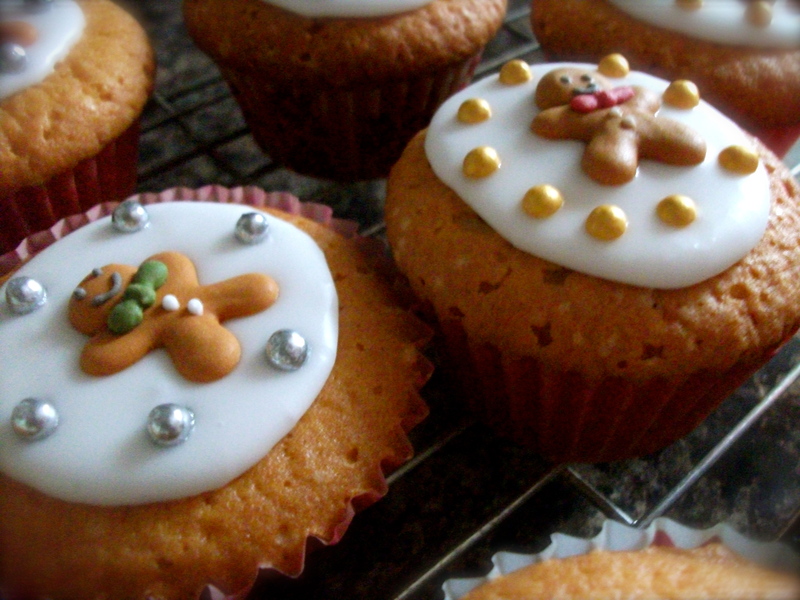 Gingerbread icing shapes with gold and silver baubles. Finally, I hope you all have a lovely Christmas and I wish you all a very happy and healthy new year! You may or may not have heard that marshmallows are making a comeback this season. 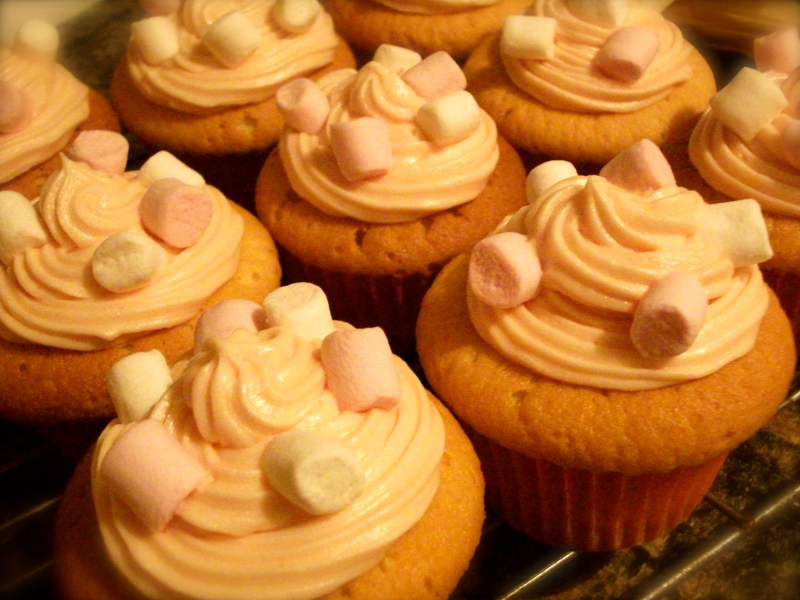 Filled with nostalgia, a marshmallow cupcake is the perfect treat this winter. 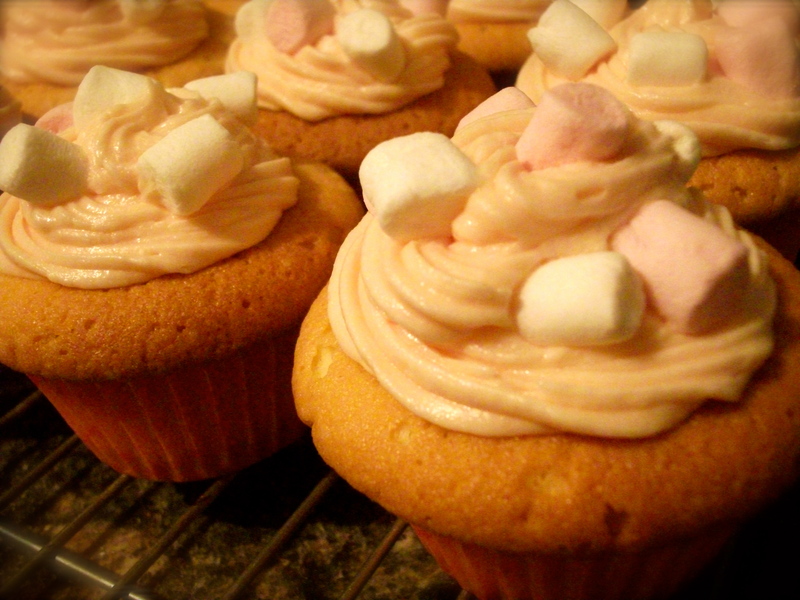 These cupcakes (recipe from the Hummingbird Bakery) were delicious, not only are the mini marshmallows super cute, but the melted marshmallow inside is a great surprise! 1. Preheat the oven to 170°C (325°F) gas mark 3, ensuring the shelving is in the centre. 2. Combine all the dry ingredients in a bowl. Sift the flour, along with the sugar, baking powder and pinch of salt. 3. 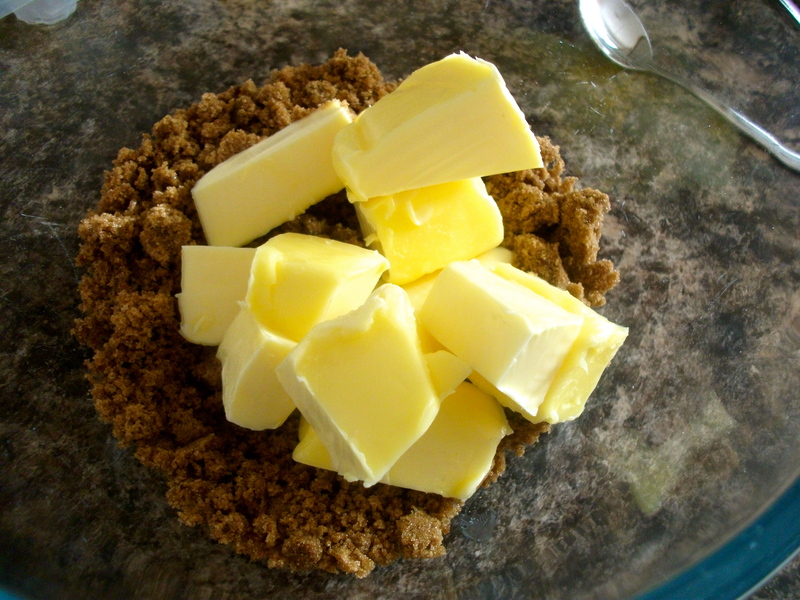 Add in the softened butter and beat until combined. 4. Gradually add in the milk. 5. Whisk together the egg and vanilla extract separately before adding to the cake batter. 6. Give all the ingredients a final mix together until combined. Try to not over-mix! 7. Divide the mixture equally between the paper cases and bake in the oven for 20 to 25 minutes, or until golden brown and a skewer comes out clean. Leave to cool. 8. Melt the medium marshmallows in a heatproof bowl over a simmering pan of water. Leave until completely melted and smooth. 9. Hollow out a small section in the centre of each cake and fill with a dollop of the melted marshmallow. Leave to cool. Place the cake top or the ‘cake lid’ back on top. 10. 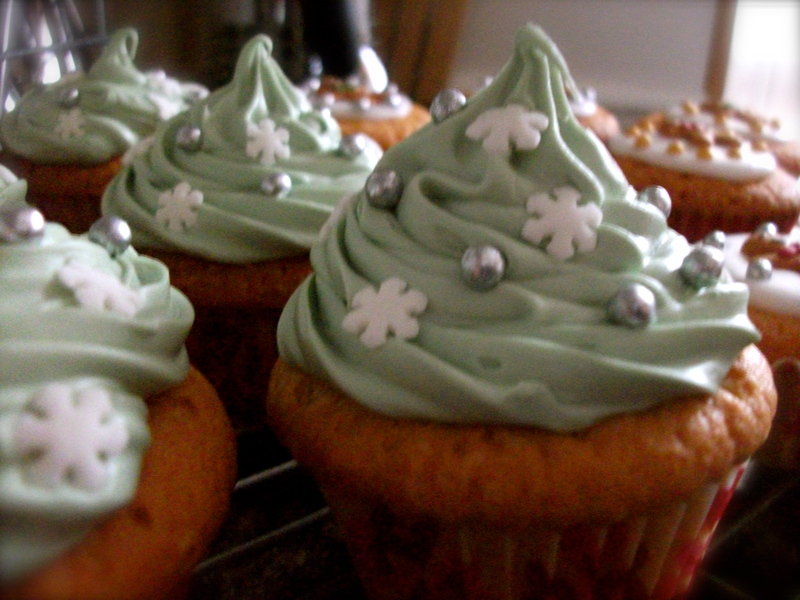 For the frosting, beat together the softened butter and icing sugar until smooth and creamy. 11. Add in the milk if the frosting is too thick. Add the food colouring, if using. 12. 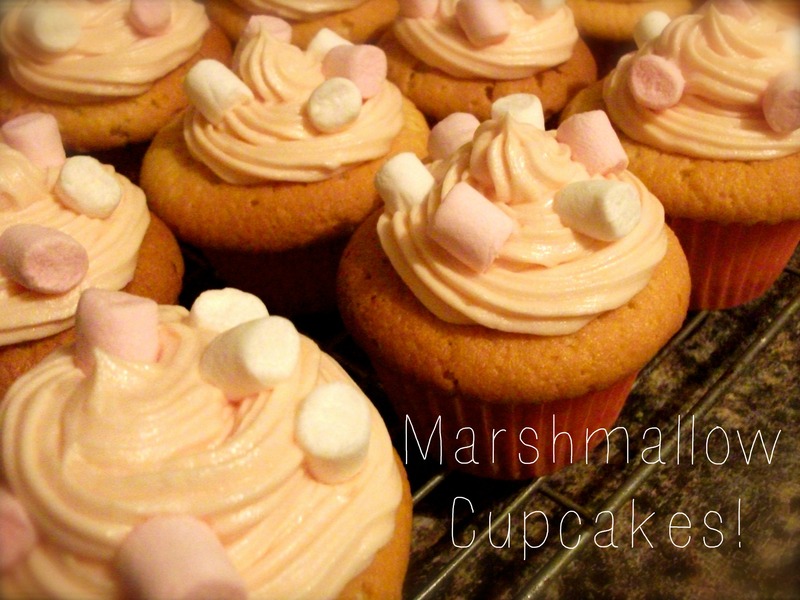 Either stir the marshmallows into the icing or pipe a little frosting onto each cupcake and decorate with the mini marshmallows. 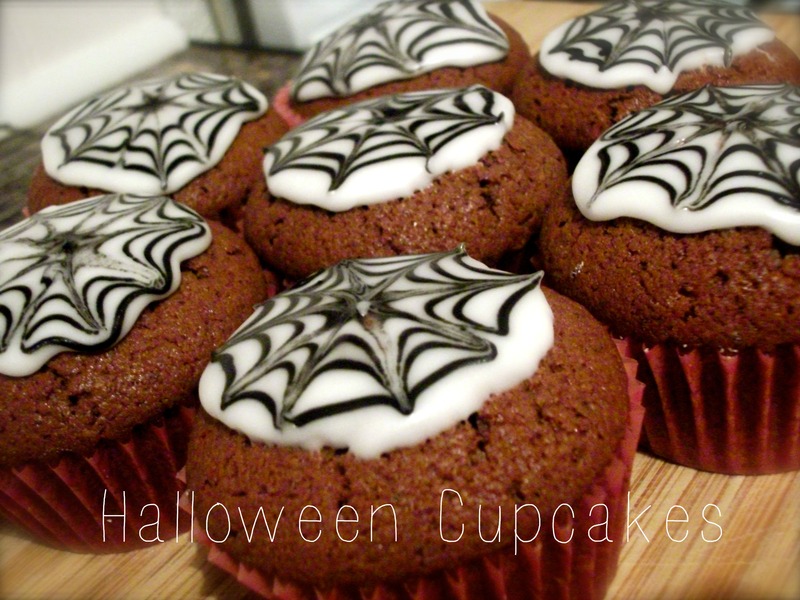 Halloween will soon be with us once again so to get us all in the mood for the spooky festivities, I thought I’d have a go at baking some Halloween themed cupcakes. 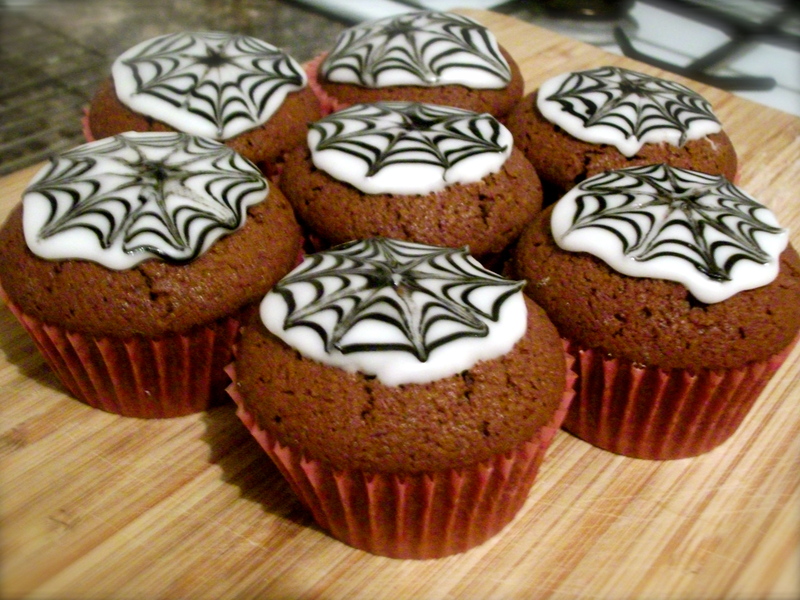 Now, I know these cupcakes aren’t perfect, but whose seen a perfect spider web anyway!? 1. Preheat the oven to gas mark 4, ensuring the shelving is placed in the centre. 2. 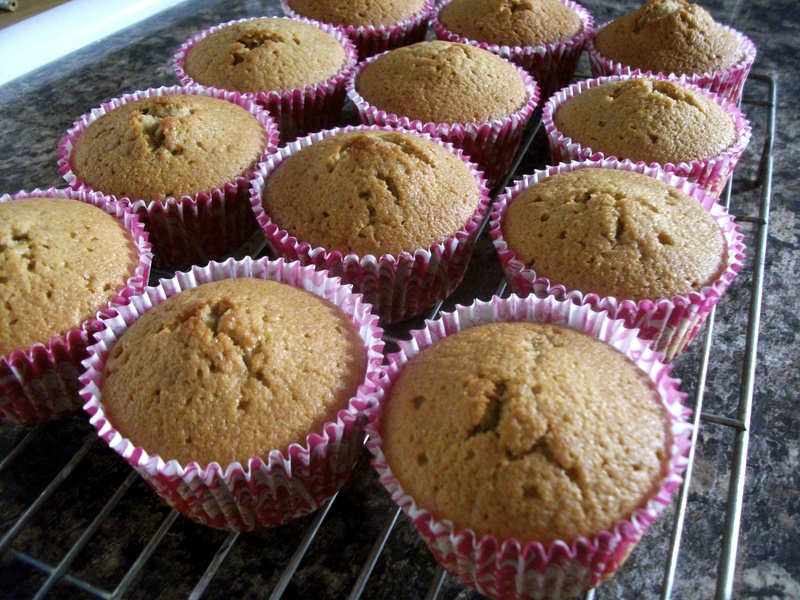 Place 12 cake cases in a muffin tin. 3. Cream together the butter and sugar until light and fluffy. 4. Sift in the flour and cocoa powder, and gradually add each of the eggs. 5. Divide the mixture equally between the cake cases and bake in the oven for 15 to 20 minutes, or until risen and a skewer comes out clean. 6. Leave to cool before icing. Sift the icing sugar into a bowl, add the water and give a good mix until well combined and fairly thick. 7. 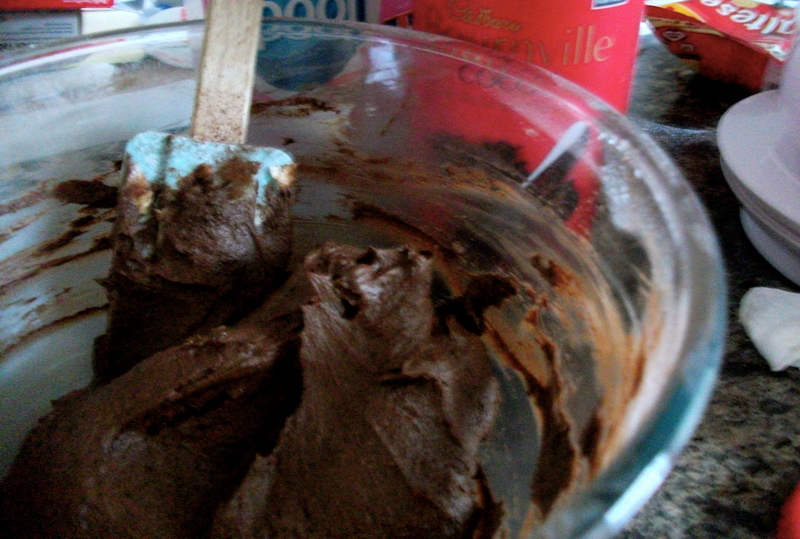 Spoon a little icing onto each cupcake using a teaspoon. Use the back of the spoon to form a neat-ish circle. 9. 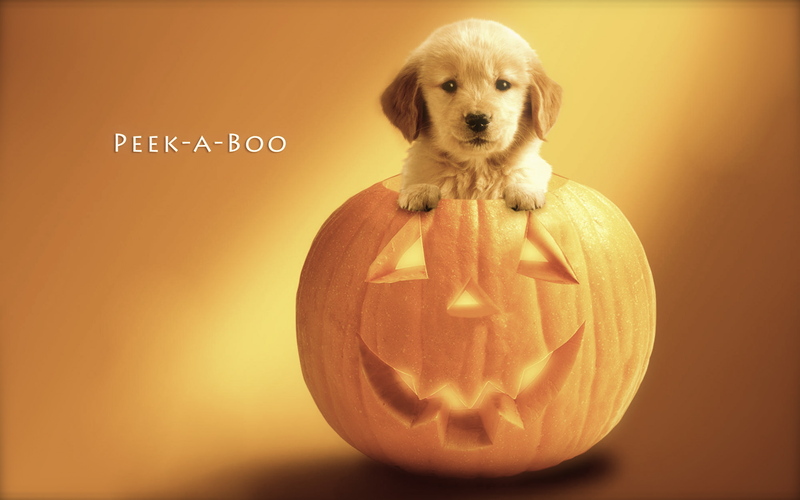 Leave to set before giving out to trick-or-treaters. Or just eat them yourself. I originally found this recipe over at the Good to Know website (this is a site I regularly use for recipes, you should definitely check it out!) 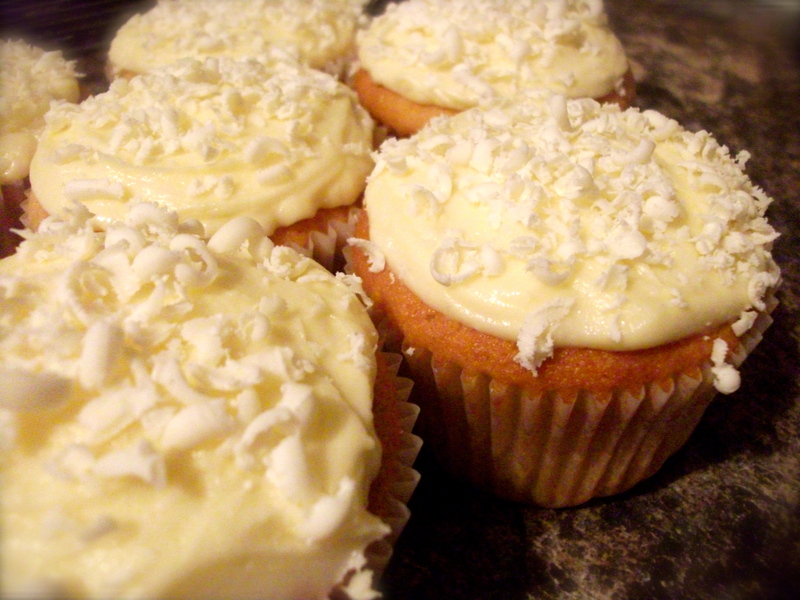 and thought that the combination of white chocolate and lemon sounded quite interesting and most certainly yummy. I’ve been wanting to try working with white chocolate for a while now seeing as I generally prefer to bake using milk or dark chocolate. 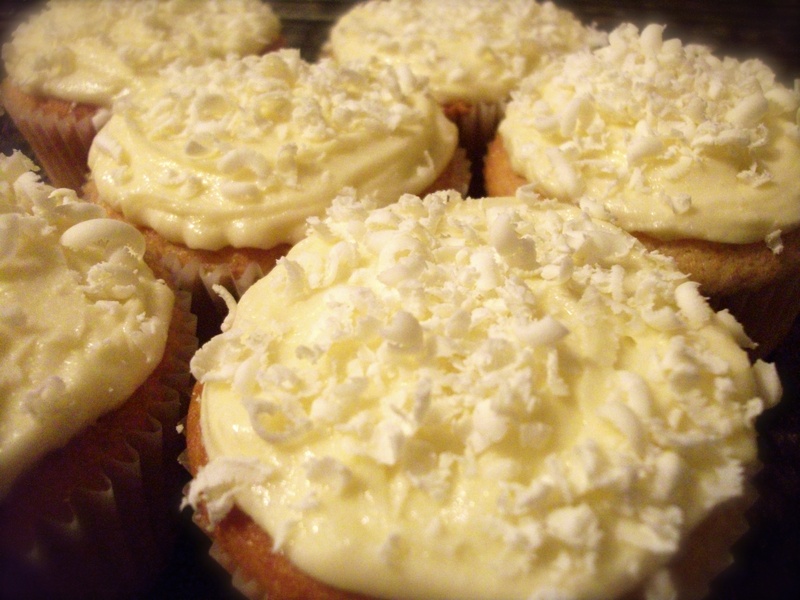 I was pleased with the results of these cupcakes, not only was the sponge light and fluffy but the lemon came through well and complimented the sweet, but not too sweet, white chocolate frosting. If you’re in need of a new recipe this weekend, I’d recommend you give this one a go! 1. Preheat the oven to gas mark 4, ensuring the shelving is centred. Line a cake tin with 12 cases. 2. Cream together the butter and sugar until light and creamy. 3. Gradually sift in the self-raising flour and baking powder. 4. Add the milk, eggs and grated lemon zest and give a mix until combined together and a smooth cake batter has formed. 5. 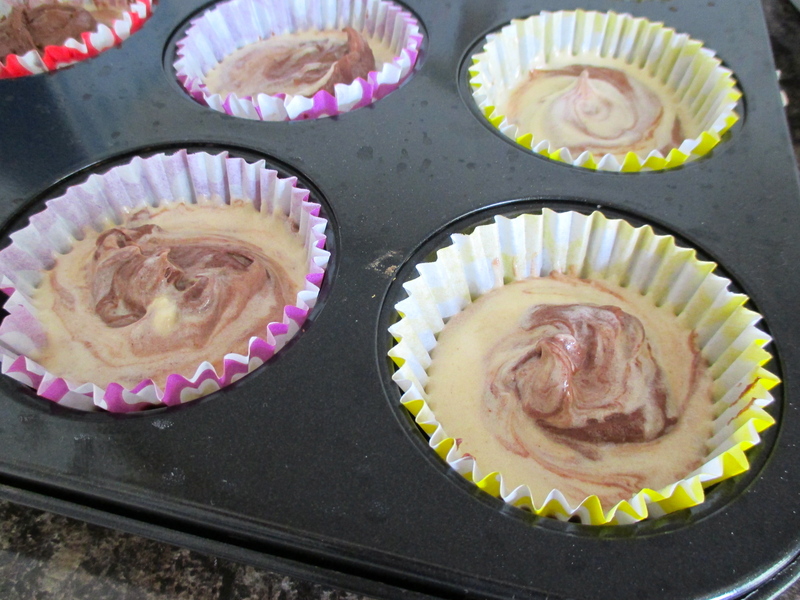 Divide the mixture equally between the cake cases and bake in the oven for 18 to 20 minutes or until golden brown. 6. 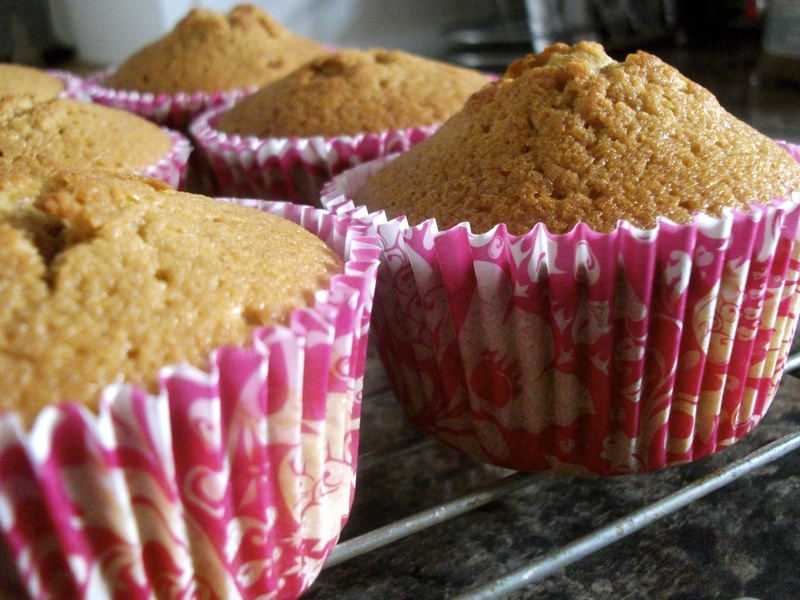 Leave the cakes to cool before adding the frosting. Melt the white chocolate either in the microwave or gently over a pan of hot water. Leave the white chocolate to cool slightly. 7. Cream together the softened butter and icing sugar. Add the white chocolate and gently mix together. 8. Either spoon or pipe a little frosting onto each of the cupcakes. 9. Decorate each cake with some grated white chocolate (if there is any left over as you may be like me and eat as you bake!) If you do decide to grate chocolate on top, keep the white chocolate in the fridge beforehand so it doesn’t melt with warm hands. 10. 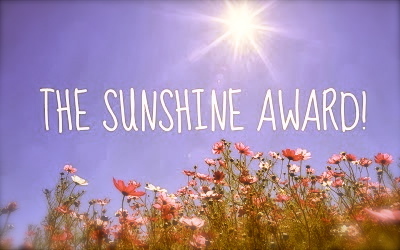 Share with your friends (only if you want to!) and EAT!